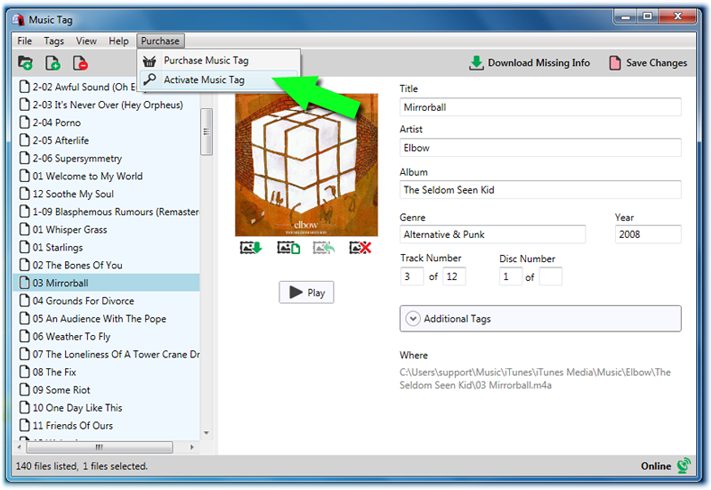 How to activate Music Tag. Select "Activate Music Tag" from the "Purchase" menu in Music Tag. Enter your Music Tag activation code and click "Activate". 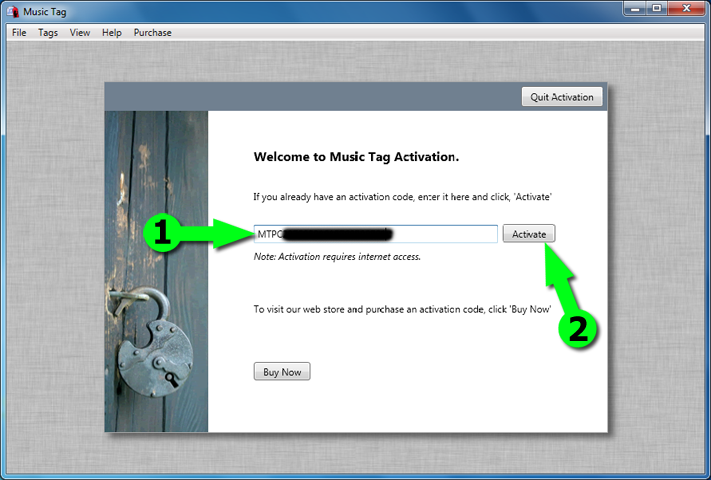 Enter your email address, set a password and click "Activate Music Tag" to complete the activation. This article details how to activate Music Tag, please follow the steps below on how to activate Music Tag manually. Run Music Tag by double clicking on the Music Tag icon on your desktop. When the Music Tag window opens, you will need to click on the "Purchase" menu option and then select "Activate Music Tag" as shown below. Click this button and it will open a window prompt for you to enter your activation code which you received when purchasing Music Tag. Enter you activation code in the box (1) and then click 'Activate' (2). Your activation code should begin with MTPC for PC and MTMC if for Mac. If you don't have an activation code you can purchase one here. 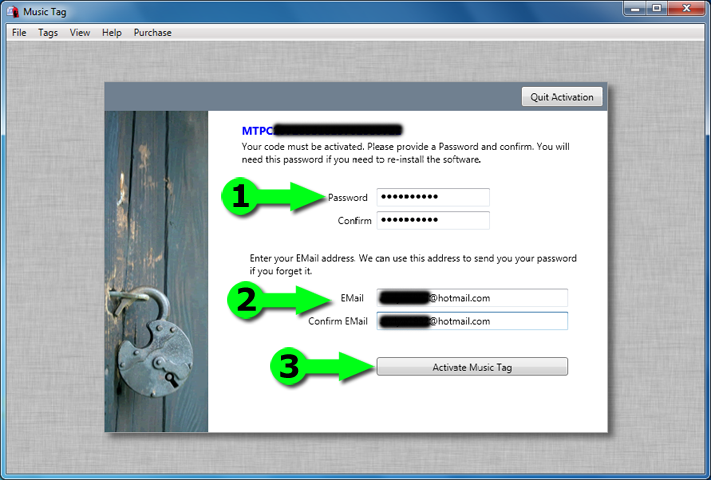 You will then be asked to enter a password for your activation code, and a recovery email address for your password. This password is for security and anti-piracy reasons, and will only be needed should you have to re-activate Music Tag at a later date or on a different computer. 1. Enter a password for your activation code and then re-enter to confirm it. Please ensure that your password only contains alphanumeric characters and no punctuation, and note that Music Tag passwords are case sensitive. 2. Enter your recovery email and again to confirm it. This recovery email is used should you forget your password in the future, when needing to re-activate Music Tag. 3. Once you have completed the above information, click the 'Activate Music Tag' button. You will have now successfully activated Music Tag, and the screen below should be displayed as confirmation. 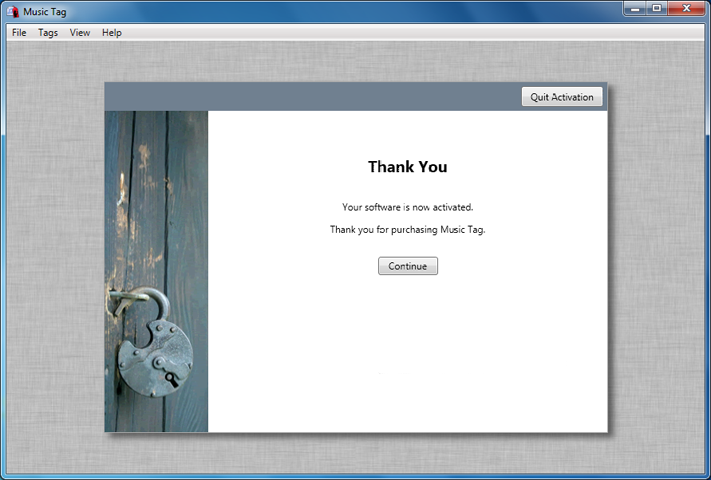 Click 'Continue' to return to Music Tag and begin using your software. All demo restrictions will now have been removed.